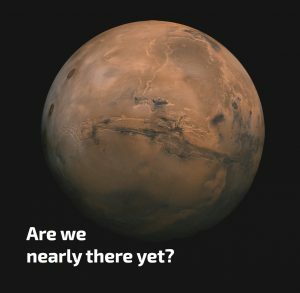 Family Space Explorers: Are we nearly there yet? If you’ve been part of one of our Family Space Explorers session, you’re probably here looking for other ways you can explore space with your family. Take a look at the sections below to find out more about the many space robots in our Solar System, and four excellent activities you can do at home to explore space! 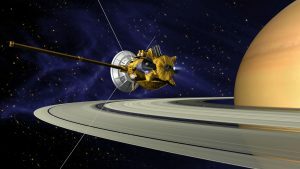 Cassini is the spacecraft here, with the Huygens lander tucked inside the cone-shaped thing right in the centre of the image. In January 2005 Huygens was dropped into the atmosphere of Saturn’s moon Titan, testing the gases all the way down to the surface. 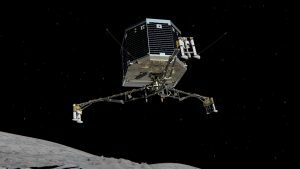 Philae was the lander dropped by the Rosetta spacecraft onto the surface of a comet with the snappy name ’67P/Churyumov-Gerasimenko’, in 2014. 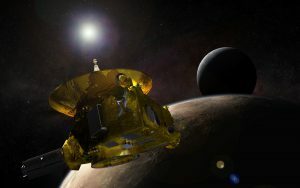 Zooming out to the furthest reaches of the Solar System, New Horizons sent us back astonishingly detailed pictures of Pluto. 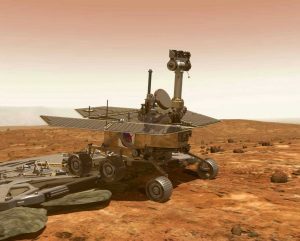 The amazing Curiosity is trundling around Mars right now, studying the climate and geology. 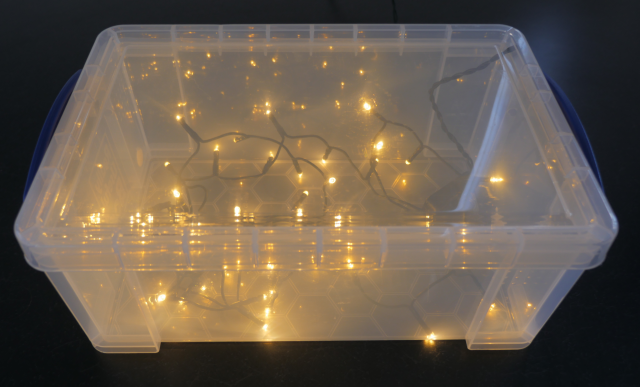 Make your own light box using a plastic storage box and strings of fairy lights. To find some great ways to use your box, click here. The constellations are groups of stars that form shapes or patterns in the sky, often people or animals. Ancient people made up myths about these constellations. Can you spot any shapes or patterns in the lights of your light box? Can you make up stories about these? As well as using the space rovers from the story as inspiration, you could make other space themed pictures including rockets, space stations and robots. 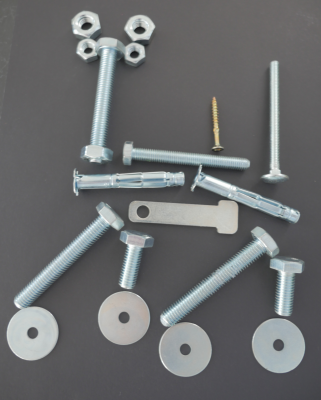 Click here to find out more ways to experiment and play with nuts and bolts. Always supervise your children when playing with small pieces! You will need: aluminium foil, one piece of black paper or card, a glass bowl, a torch, and pair of scissors. Fill the glass bowl with water until it is about two thirds full and set it aside. Cut small pieces of aluminium foil and shape them into little stars. Place the stars on top of the black paper or card. Place the glass bowl on top of the stars and turn off the lights. Shine the torch through the water at the stars. Tap the bowl and see what happens to the stars when the water moves. 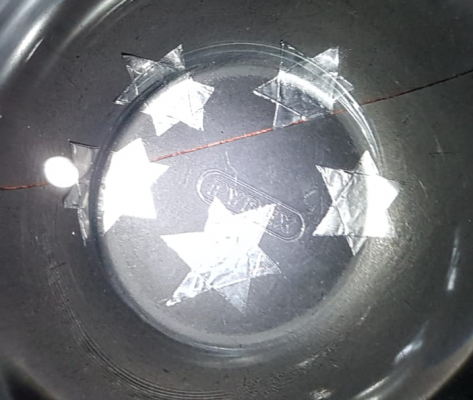 When you shine light on When you shine light on aluminium while water is moving, the light travels through the water and makes the aluminium stars twinkle. Similarly, when the light from a star travels through the Earth’s atmosphere at night, the air it travels through makes it appear to twinkle. You will need: paper, crayons or felt tip pens, sticky tape, drinking straws. Cut a piece of paper about 5 cm x 20 cm. Decorate the paper with crayons or felt tip pens. Tape the roll along the edge to keep it rolled. Fold the top of the paper tube down and tape it. You could also fold the edges in if you wanted it to look more rocket shaped. 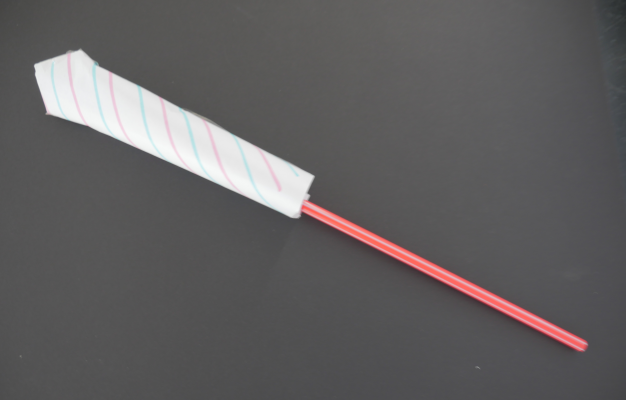 Put the paper tube on the straw – and blow. There are many ways to investigate your straw rockets: race them, aim them at targets, see how far you can blow them, blow multiple rockets at once! Would you like to find more books about science and engineering with great stories, fabulous role models, and astonishing ideas? Follow this link to our marvellous selection.